Wiki lists more than 100 adaptations of Charles Dickens’ A Christmas Carol, for theater, radio, opera, graphic novel, TV, including at least 21 films, starting with a 1901 British silent (and that number doesn’t include the parodies and homages such as the numerous TV series that have a Christmas Carol episode). 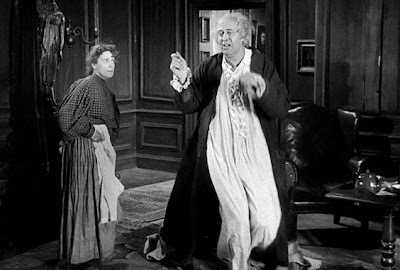 Everyone has their favorites: mine are Scrooged (yes, Bill Murray), and the Alastair Sim version, which tops the list for many generations of holiday viewers. What is it that sets the Alastair Sim version produced and directed by Brian Desmond Hurst — celebrating its 60th anniversary today — apart from the rest? Well, I’d say it’s because it is the result of the perfect Celtic marriage: a Scottish actor and an Irish director. Seriously. The Celtic DNA knows how to deal with ghosts, tormented souls and redemption like no other race and they would have a particular affinity with the creative genius of their Anglo-Saxon cousin Dickens. Brian Desmond Hurst was born in East Belfast in 1895 into a working-class family of iron workers. In 1914, he enlisted in the British Army and survived the slaughter at Gallipoli with the Royal Irish Rifles. He went to Hollywood in the late 1920s and it’s not surprising that he became friends with John Ford — some accounts said he was one of Ford’s assistants — and had a cameo alongside John Wayne in Hangman’s House (1928). In 1933, he moved back to England, and the films he directed were seeped deeply in the Irish and English literary tradition: a version of John Millington Synge’s great play Riders to the Sea (1935), which he shot in Connemara with actors from the Abbey Theatre; Ourselves Alone (1936), a love story set against the Irish War of Independence (and the translation of Sinn Fein, a factoid I first learned from a Columbo episode! ); and The Tenth Man (1936) based on the play by Somerset Maugham. In the 1940s, he directed several war films/re-creations, some would say propaganda, working with the Ministry of Information. One is A Letter from Ulster (1943), where "Hurst was able to persuade one Catholic and one Protestant soldier to write letters home, explaining their impressions of their stay." Another, Theirs Is the Glory (1946), was about the British forces in Operation Market Garden. 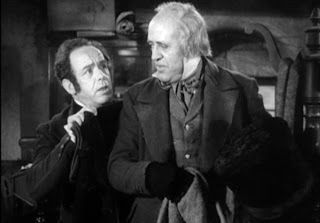 I don’t know how the job of directing and producing Scrooge, as it was released in Britain, fell to Hurst, but it was an inspired choice given his sensitivity to literature. And then his DNA kicked in. An Ulster man grows up believing that the supernatural simply coexists with the natural world. Hurst in his own words: "I don’t remember very much about my mother because I was only 3½ when she died, but I remember running into the house one day and asking her for a biscuit. I was still dressed then as a little girl, because in Ulster we believed that the fairies only stole little boys, and didn’t want little girls." From Yeats’ The Celtic Twilight — where he wrote down "true tales" of ghosts and spirits and faeries as told to him by various people — to the Conor McPherson film The Eclipse, with Ciaran Hinds as a volunteer at a literary festival who is drawn to an English author who writes ghosts stories — Celtic culture simply abounds with the dead and the undead sharing all sorts of things. Hurst’s literary nature combined with his Irish sensibility helped create magic on screen. The film’s atmosphere is authentically creepy, treating the ghosts with respect, and then truly joyous, as we know the Irish can be. In short, what we have in this rendition of Dickens' sometimes misunderstood Carol is an accurate comprehension of the agony of a shabby soul. And this is presented not only in the tortured aspects of Mr. Sim but in the phantasmagoric creation of a somber and chilly atmosphere." It’s the final transformation, then, into the light, that I believe makes Sim’s good portrayal superlative. One of humanity’s deepest fears is that of missing out: missing out on love, a career or a creative dream. It’s a harsh reality for everyone at some point. You accept the defeats small and large because you have to, as they say, "what can you do?" 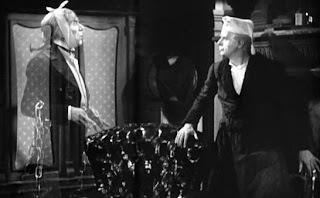 As Ebenezer slowly begins to see how mean he has become, he fears The Ghost of Christmas Yet to Come — the Phantom — and his own death. "Well!" said the first, "old Scratch has got his own at last, hey?" And to underscore that Scrooge's soul is headed to Hell, Arthur Rackham's illustration of this exchange shows an enormous cloven-hoofed Satan looming behind the two businessmen, with his long fingers gesturing to Ebenezer. The Phantom leads Scrooge to the cemetery and the great scene of Scrooge seeing his name on the tombstone. "Spirit! he cried, tightly clutching his robe. "Hear me! I am not the man I was. Why show me this, if I am past all hope?" Holding up his hands in a last prayer to have his fate reverse, he saw an alteration in the Phantom's hood and dress. It shrunk, collapsed, and dwindled down into a bed-post. When Scrooge wakes up back in his bed, he’s thrilled but doesn’t know what day it is, how long the spirits have taken. When he learns that he hasn’t missed Christmas he is elated, light as a feather. He hasn’t missed it!!! The joy at being given another chance is like no other. (And, if you believe that what you “haven’t missed out on” is the eternal salvation of your soul, the elation gets kicked up a whole other notch). Sim’s Christmas Day giddiness is one of the great gifts to cinema. 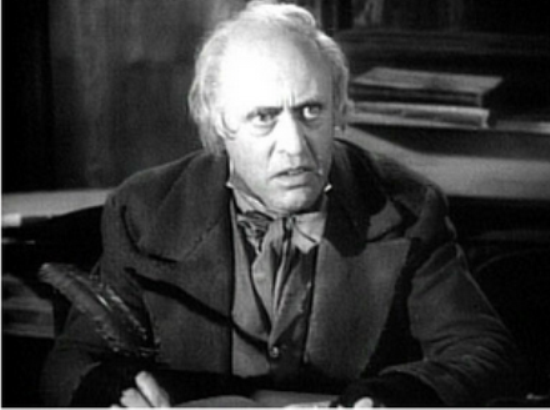 If Scrooge can become that happy, than surely there is hope — for everyone. Hurst rounds out the film with a great soundtrack. Music, another thing the Irish know something about.